Last October, I joined Boston Handmade with my etsy shop BooksByBexx. My “How I Get My…” mini books for vegetarians and vegans had recently become very popular, and I was hoping to expand my business enough to start doing craft fairs. The only problem was that I didn’t think I could make enough books on my own to fill a table. 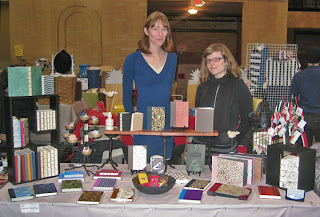 My friend Katherine and I started talking, and decided to team up to form White Sparrow Bindery. We spent much of last fall preparing for our first show – the 2008 Boston Bizarre Bazaar (pictured above). We set up an etsy shop shortly thereafter, and did a few smaller shows last spring. After graduating in May, we decided to go full speed ahead with White Sparrow Bindery. The bulk of my new work is now being done for White Sparrow Bindery, although BooksByBexx will continue to sell a more limited range of items. Since my own focus has shifted, I decided that my Boston Handmade membership should reflect this. Selling at craft fairs hasn't been the only perk of forming our partnership - we help to inspire and motivate one another, while also working together to solve problems or create new bindings. Some of our work is done individually, and some of it is done collaboratively, and we each bring our own sense of style and skill set to the work we do. I’m really excited about the new direction I'm moving in, and the opportunity to involve my new business in all of the fantastic show, blogging, and info sharing possibilities Boston Handmade has to offer! It's wonderful to see what you're up to. This is a great photo of the two of you and your great table set-up. Here's to your continued success!